The last gasp of winter vegetables…. Today is the first day of spring, but no one has told the vegetables. We are in the weird space where the winter fruits and vegetables look edible but don’t taste like much, and the berries and lettuces of spring have yet to appear. So, tonight for dinner we did our best with the last gasps of the winter vegetables. 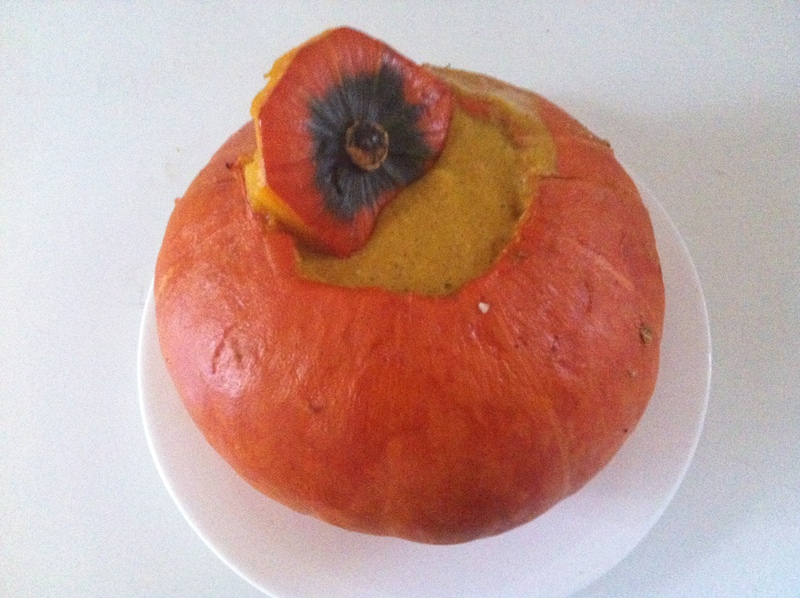 It worked out because, I have been want to making pumpkin soup in a pumpkin, and it was now or wait six months….I actually used large Kabocha squash, because real pumpkins were nowhere to be found. I cut the tops off the squash and scooped out the seeds. In a separate bowl I mixed the spices, almond milk and olive oil. You could use other kinds of milk easily, also, this would be great with chunks of bread added at the end. Depending on the size of your pumpkin/squash the amount of milk you need will vary. After you have mixed up the spices and the milk, pour the mixture inside your pumpkins. I put some foil between the hole I had cut, and the top that fit neatly in, when it cooks the top could shrink and fall in. Bake at 350 for an hour. When the flesh of the pumpkin is soft but not collapsing, pour the mixture into the blender. Scoop the flesh of the pumpkin that has been softened by cooking, careful to leave a thick enough layer to act as a bowl. Blend the softened pumpkin and milk mixture and pour it back into the pumpkins, and serve. As always, my kids will eat it because they find eating out of the vegetable fascinating….It was very filling, so after everyone was stuffed I threw the remain soup and the disinegrating pumpkin bowls in the blender and made a thick soup that will be great for lunch tomorrow.